Click here for audio of Episode 2002. Today, guest historian Cathy Patterson with a story about patents. The University of Houston presents this series about the machines that make our civilization run, and the people whose ingenuity created them. In 1449, King Henry VI of England granted John of Utynam a 20-year monopoly to make stained glass. John had a new method, not yet known in England. John was a master glass-maker from Flanders. He came to England to make the windows for Eton College. The crown issued him Letters Patent, sealed with the King's Great Seal, to guarantee John's privileges. So John of Utynam received the first recorded patent in England, home to the the oldest continuous patent tradition in the world. John's was probably not the first patent ever issued -- Venice issued patents to glass-makers in the early 1420s. But John of Utynam's successful quest to protect his methods gave birth to a system -- a system that gave people official sanction to enjoy the economic benefits of their own ingenuity. The purpose of such patents was not at first very clear. Government saw them as a tool for promoting invention, and thus, trade and commerce in general. But entrepreneurs also exploited the patent system simply to gain economic advantage. Patents of invention -- which everyone agreed benefited the commonwealth -- were jumbled in with patents of monopoly of all sorts -- for making saltpeter or gold and silver thread. Some patentees obtained monopolies for manufactures or trades that were not new. Royal favorites regularly gained patents in return for timely donations to the royal treasury. And the crown was also known to refuse patents for inventions considered unseemly -- Sir John Harington's water closet design failed to gain a patent in 1596 for just this reason. Those willing to curry favor at Court and exploit economic gain navigated the patent system most successfully. The abuse of monopolistic patents provoked a public outcry by the early 17th century. Under pressure, King James I revoked patents and monopolies, declaring that "monopolies are things contrary to our laws". But he made an important exception -- he allowed patents for "projects of new invention so they be not contrary to the law, nor mischievous to the state." Parliament later codified this into law in the 1624 Statute of Monopolies, which also established time limitations: patents would be granted for "14 years or under ... to the true and first inventor." This statute established foundations for patent law that are still in use today. Invention can be protected, but the public interest must be considered. England's history tells us that patents have always been tricky things. Their purpose is at once intellectual and economic. They can be open to abuse, as well as to legal and ethical interpretation. Whether for stained glass windows or water closets or genetically modified mice, patents protect invention. But the noble purpose of promoting ingenuity is haunted by the specter of monopoly. The answer to the question "Should it be patented?" has never been patently obvious. I'm Cathy Patterson, at the University of Houston, where we're interested in the way inventive minds work. Many books deal with the history of patents and patent offices. One standard text is Arthur Gomme, Patents of Invention: Origins and Growth of the Patent System in Britain. (London: Longmans Green and Co., 1946). Christine MacLeod, Inventing the Industrial Revolution: The English Patent System, 1660-1800. (Cambridge: Cambridge University Press, 1988) offers a useful introduction to the early history of the patent system. 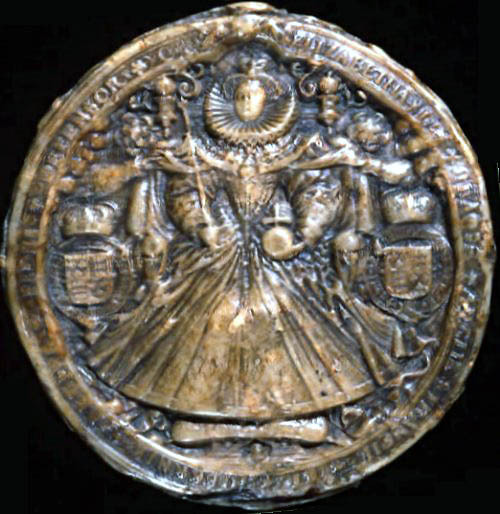 The Great Seal of Queen Elizabeth I, which would have been used on letters patent, courtesy of the National Archives: See this National Archives site.